Your voice. Your language. Your newspaper. Available in: Chinese, French, German, Italian, Japanese, Portuguese, Russian and Spanish. 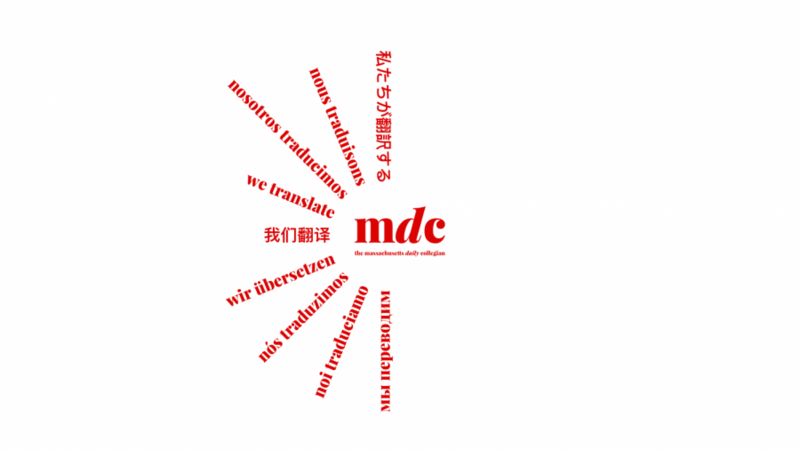 On the Massachusetts Daily Collegian website, you can read our articles in a patchwork of languages – nine, to be exact: Chinese, English, French, German, Italian, Japanese, Portuguese, Russian and Spanish. All of these languages are spoken at the University of Massachusetts and in the greater surrounding area, and we feel it is important to provide students access to news in whichever language they feel most comfortable reading. With over 60 languages and dialects spoken on campus and in the Pioneer Valley, why should the official student newspaper at UMass be publishing only in English? If hospitals, police stations and other public services provide interpreters, then the Collegian can make information accessible in more than one language, too. One year later, when we agreed going primarily digital would help the Collegian better serve the community, we asked ourselves, why do we only publish in English? We could not say we were fulfilling the Collegian’s mission if we did not work to see the Collegian become reflective of the multilingual community it serves. As the University continues to be a space for swastikas, homophobic slurs, racial threats and alleged violations of the Civil Rights Act of 1964, the Collegian will continue to be a platform for student voices and information – a tool with which to make informed decisions. Our responsibility is to make sure all readers can easily access and use this information. By providing our articles in multiple languages online, we firmly stand in that role. We translate because we believe in more than providing access to information; we aim to provide it equitably. At the top of the paper, our masthead reads “A free and responsible press,” and at the top of our website, “A free and responsible press serving the UMass community since 1890.” Our readers should feel that we live up to those statements. We have a long way to go to make the paper truly representative of the student body; this is only a start.